The first day of our journey went rather well. This first day was supposed to be a shake-down cruise. To test all the new gear, to reacquaint ourselves with traveling more than 100 miles before we start seeing the same things over and over again, to get a feel for being back on the road again. All in all I'd have to say "Mission: Accomplished". Our plan was to rent the U-Haul last night and load up the bike for an early start this morning. When my Dad realized we wanted the U-Haul only to get us as far as the nearest clear (non-icy) road he graciously volunteered his truck and trailer and chauffeur services to carry us down the hill. Being the epitome of the saying about how the cheapest part on a BMW motorcycle is the rider, I readily agreed. 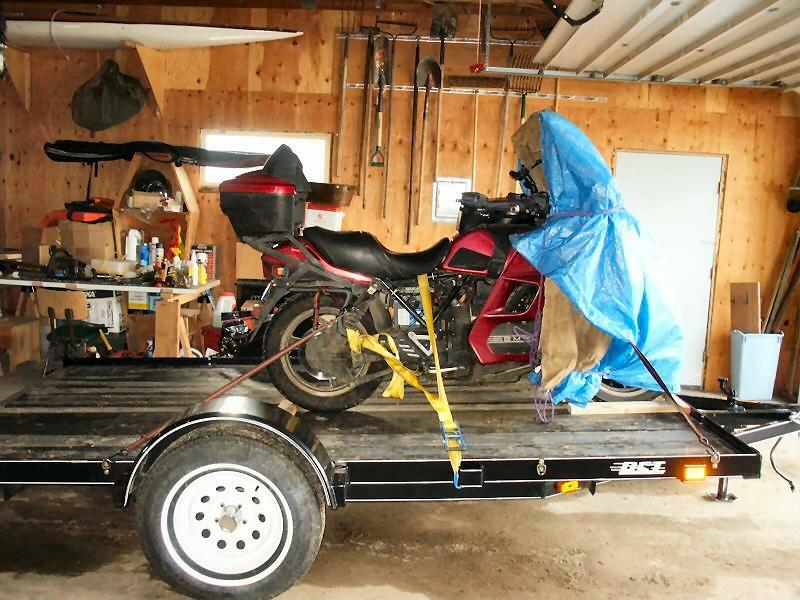 Here's a shot of the bike loaded on the trailer ready for its ride down the hill. Our start did not get off quite as early as I had planned but by 1015 we were unloaded, packed up, and headed down the road about five miles west of Whitehall, Montana. Just as well we took the offered trailer tow because there was still a bit of frost and sand in the corners of the switchbacks over Highway 2. By the time we got the bike unloaded and packed I was well on my way to working up a sweat so I decided to forgo putting on the electric chaps. Just as well... A few hours later I had my jacket unzipped, my vest unzipped, and was trying to catch air in my gloves in a vain attempt to cool off. We intended on getting as far as Miles City, Montana this evening with a brief stop-over in Forsyth because Tamara has family in both places. While in Forsyth she learned that the folks in Miles City wouldn't be available so we decided to push on through. Recalculating a new route we figured we could easily make it as far as Bell Fourche, SD in short order so off we went. We could have gone further but she's got family in the area and we're gonna hang around for a couple days. As we're cruising through town with the Garmin GPSMap 376c dutifully pointing the way to the Super-8 (with the XM Radio 70's station playing in the background and the NEXRAD RADAR showing us a thunderstorm creeping along behind us) Tamara notices a sign for the King's Inn that announces it provides free wireless Internet access. In we pull. With a bit of caution we ride up next to the door labeled "Office" but see nobody around. It's late, perhaps the proprietor is already in bed? About that time I notice shadows moving about inside and a guy comes to the door with a hearty wave. "Gotta room?" I ask. "For a BMW rider?" he asked in a heavy accent, "Of course! I'm German!" As we are completing our transaction we're making small talk (well, as small as it can be with a happy crazy German) and it turns out to be a pretty small world. Both he and I are divers, we've both spent time in Hawaii and Guam (and prefer the diving in Guam) and so on and so on... (I just realized I forgot to tell him I was born in Germany...) After he tells us we are in a room on the second floor I inquire as to the possibility of a ground floor or at least one that looks out over the parking lot. Catching on pretty quickly he tells me, "Nothing to worry about, this place is protected by the Mafia!" Besides, he would help us carry our stuff up to the room. As we're parking the bike he asks me if I was planning on riding anywhere else tonight. When I answer in the negative he insisted we join him in a shot of "Good Vodka". Until this evening I thought those terms ("good" and "vodka") were mutually exclusive. Turns out I was horribly wrong. With Tamara not being much of a drinker and I being in my customary non-eating mode of travel that first shot went down rather well. One shot turned into two and we had to respectfully decline a third shot or he would have been carrying us up the stairs as well as all our gear. To hell with Super-8, I like this place. We'll be hanging out here for a couple days before pulling up stakes and heading further east. I was a bit concerned about the fuel economy we'd be getting. Before we left Hawaii it had dipped into the low 30's with just me and zero gear on the bike. One of the many little, cheap, and easy things I did to try to correct the situation must have fixed it because even with it being as loaded as it is and holding 75-80 mph all day long we averaged 40 mpg today!